Over the next ten years, some predict that 50% of the S&P 500 will be replaced by organizations that are built to excel in this era of digital disruption. As the co-founder and CEO of an employee engagement platform, I’ve found it’s critical to be able to adapt. So how can we improve our chances to survive and thrive in this new reality? Unfortunately, I’ve observed that many organizations are still are not built to support the Fourth Industrial Revolution because they still have a structure resembling the top-down command-and-control model. From my perspective, in order to cultivate agility and innovation, which I believe are the key ingredients to success in the age of disruption, businesses should strive to empower individuals at the team level by providing more autonomy and the right to make decisions. In a climate of constant disruption, leaders can’t possibly have all the answers. Instead, engage in what I like to call “active inquiry” to help harness the wisdom of all the members of the team and from all the people within the organization. Gone are the days where this process happens once a year in the form of a 60-question survey. Active inquiry is a continuous listening process that, in and of itself, promotes engagement while helping the organization remain nimble. 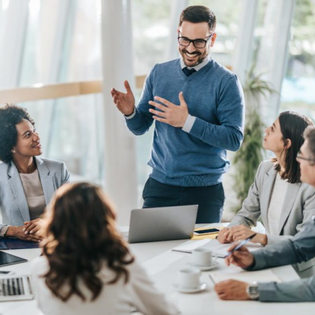 When team members are constantly bombarded with information, it’s critical to establish a process that helps direct the team’s attention and focus. Change efforts can fail if alignment is not achieved, so why continue making decisions without the input of the broader group of stakeholders? I’ve observed the challenge for most leaders is how to get everyone moving in unison when the goal posts and the rules of the game are constantly changing in real time. In order to achieve business goals, everyone has to pull their weight. Transparency is a powerful tool for driving accountability. I believe accountability can no longer be defined as a 1:1 relationship. Teammates need to hold one another accountable; the team needs to hold the leader accountable; the leader needs to hold the team accountable. Once there’s shared accountability, I’ve found trust can be established, which is the basis for all high-performance cultures and organizations. In my experience, thoughtful communication helps drive active inquiry, alignment and accountability. If communication doesn’t happen frequently and effectively, I believe you run the risk of failing. That’s why it’s essential to keep an authentic dialogue flowing in all directions at all times between leadership and employees. I’ve observed some leaders who aren’t transparent with their teams when it’s time to make decisions. But in order to become more transparent, this has to change.